… with Syslog, LogStash, Elasticsearch, Kibana, and friends, one might add. If you liked Recipe: rsyslog + Elasticsearch + Kibana, you’ll like this presentation. We’ve also published the actual 25-minute video of the presentation. For the occasion, Sematext is giving a 20% discount for all SPM applications. The discount code is MONEU2013. Also, Manning is giving a 44% discount for Elasticsearch in Action and all the other books from their website. The discount code is mlmoneu13cf. For those interested in Logsene, our Logstash + Syslog + Elasticsearch + Kibana service mentioned in the talk, we’ll notify you when Logsene becomes fully (and freely!) available next month if you leave your name on the Logsene page. Below is a sketchnote of the whole talk, which was printed and given to all attendees. Click on the image to get the full resolution. – Redis in this case is used as a buffer. For example, if the ES cluster can’t keep up with a spike of load, or needs to be restarted. b) you want to do most of the processing (such as grok) after Redis. This makes sense if you make the Logstash before Redis to do little/no processing, so that it doesn’t become a bottleneck. If you do the heavy processing after Redis and Logstash proves to be too slow, data gets buffered in Redis, giving you a chance to fire up another Logstash instance and fix the problem. If the same slowness happens with the Logstash before Redis, you might lose data. I’m very interested in your experience and architecture choices. Is it possible to you to answer this questions ? – why did you used Lumberjack and not directly Logstash client ? – why did you used Redis ? – in this case, what is the desired function used by Redis ? ElasticSearch 0.90.5 has a Redis river. 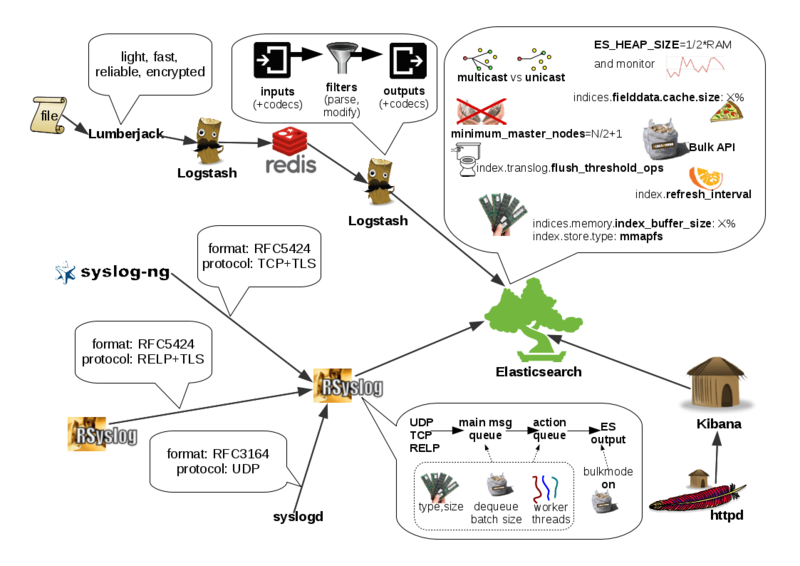 – What is the interest to use a second Logstash between Redis and Elasticsearch ?